Detroit-based Shinola and Disney today announced the launch of the Mickey Classics Collection, a capsule collection that honors 90 years of Mickey Mouse. The collaboration is part of “Mickey the True Original,” a global celebration of Mickey’s heritage, personality, and status as a pop-culture icon. Since his big-screen debut in the cartoon “Steamboat Willie” on November 18, 1928, Mickey continues to serve as the global ambassador for The Walt Disney Company. 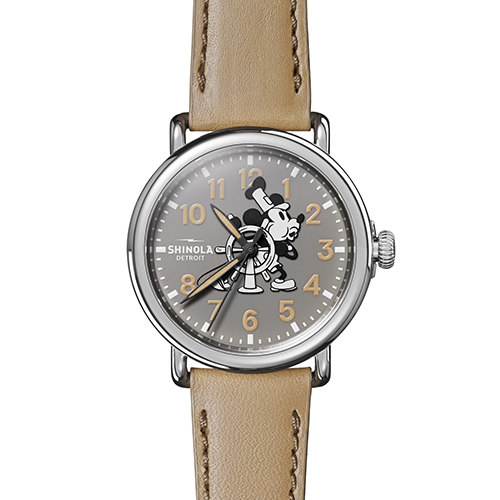 Mickey Classics is a collection of limited edition and special-edition Shinola Runwell timepieces, leather goods, audio equipment, wall clocks, and journals showcasing Mickey Mouse. Limited to 90 timepieces per style in honor of Mickey Mouse’s 90th Anniversary, each Runwell comes with one of five framed original sketches of Mickey Mouse, as well as a special-edition Shinola sketchbook with a “How to Draw Mickey” instructional booklet. Additionally, both the leather Runwell backpack — which includes a hand-stitched leather appliqué of “Steamboat Willie” — and the leather tech portfolio are lined with a “How to Draw Mickey” illustration. The Mickey Classics journals feature a flip book that animates a scene from “The Nifty Nineties” (1941) created by Disney legend Fred (Freddie) Moore, whose design and animation of the spunky little star is considered seminal in Mickey’s career. The Shinola x Disney Mickey Classics collection will be available on November 16 at Shinola.com and in Shinola stores, Disney stores, and select specialty retailers. Prices range from $28 for a journal to $2,500 for a Shinola Runwell Turntable.